And then I realize I'm actually an adult now. And I have kids that go to school and they stopped wearing shoes weeks ago. And at this point it's better to just buy new ones than to wash those things they call shoes. And their pants don't fit. Even though they are their FAVORITE PANTS. And they have to have very specific school supplies, which I *love* to buy.... but they have to come from a list that I don't even know how to begin to find... so I just go shopping and buy all my favorite school supplies and hug them and smell them and wish I could keep them. And then I *do* get to keep them because I bought all the wrong ones and I have to go back to the store and buy all the right ones. Okay, I actually don't hate that last part. School supply shopping twice?! Sign me up! But this year I'm on top of things. Mostly because for a week in July, I actually thought it might be August already, so I kind of started thinking about school. Which means... YEAY! 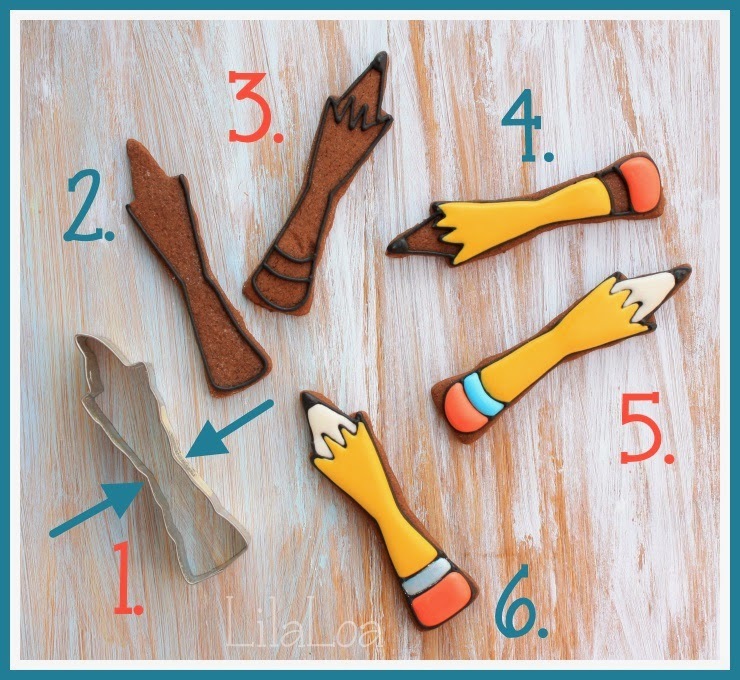 I get to tell you about these pencil cookies. 1. I love cutters that double as other cutters. As this is no exception. Grab a candle cutter and just squish it a bit in the middle. Bake cookies. 2. 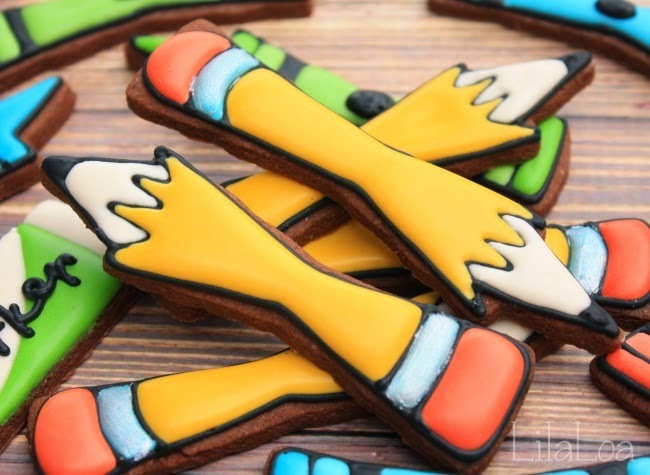 Use a #2 tip and thick black icing to outline the cookie. 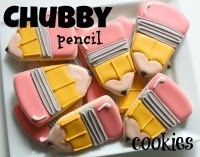 Start by outlining around the edges of the cookies. 3. Then pipe the zig-zaggy across the top part. And the tip and the lines near the top of the pencil. If you used thick icing you really only need to let it dry for 15-20 minutes. 4. Fill in the yellow wood part and the pink eraser part. Let those dry for 5 minutes. Technically, you don't have to let them dry at all, but I like to give them a minute so I don't smudge them up when I move on to the next step. 5. Add the shaven pencil part and some random color for the band at the top. I chose blue because it still looks good even if you don't end up painting it silver. Let it all dry for a couple of hours. 6. Then go back and paint the band silver. I have found that the absolute best combination for painting silver is to dip a paintbrush is silver airbrush paint, and then into silver luster dust. It gives you complete coverage with only one coat. 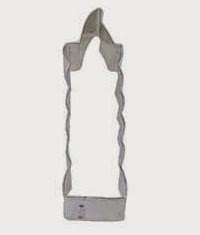 Get the candle cookie cutter HERE. 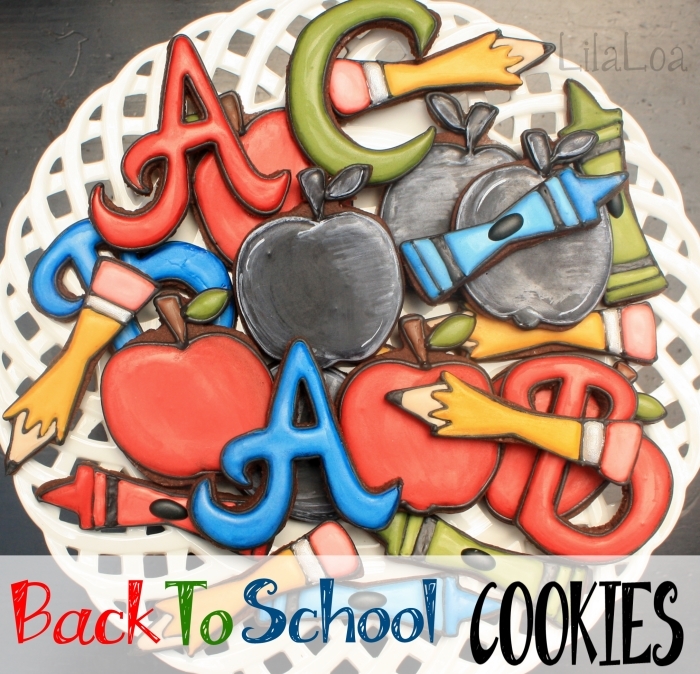 More back to school cookies AND a tip on making black icing black while using LESS food coloring HERE. 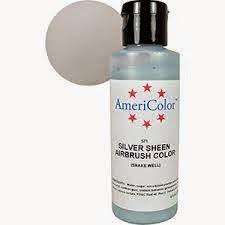 You can find the silver airbrush color HERE and the silver luster dust HERE. 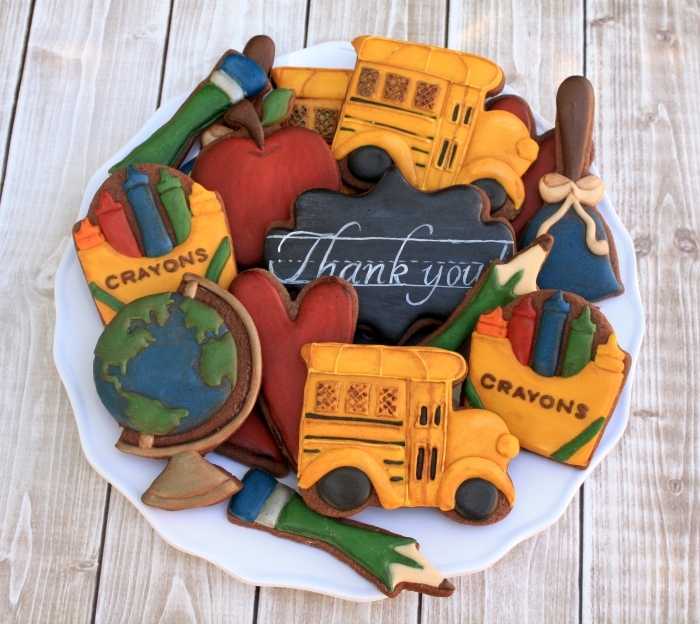 Old School Back-To-School cookies and a fun school cookie link-up HERE. Chubby pencils with Sweet Sugarbelle HERE.